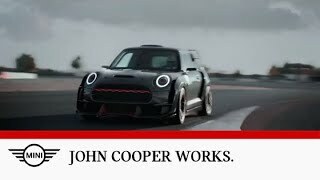 MINI has released the first details of the John Cooper Works concept which will be unveiled in January at the 2014 North American International Auto Show in Detroit. 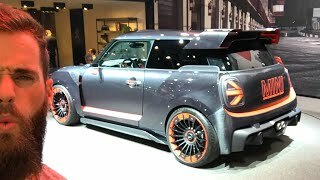 The MINI John Cooper Works Concept offers a look ahead to the next generation of the elite sports model. 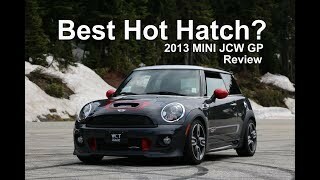 The model get innovative sportiness of John Cooper Works style, with features including exclusive body paintwork in Bright Highways Grey, red colour accents, bespoke aerodynamic features and 18-inch John Cooper Works light-alloy wheels in a newly developed design. On the exterior larger air intakes can be seen at the front with LED headlights, a new front bumper, a black surround of the front grille, contoured side skirts, a rear apron and a diffuser. The model also features a rear spoiler and several body components created to channel more air around the C-pillars. A new sports exhaust is also fitted. 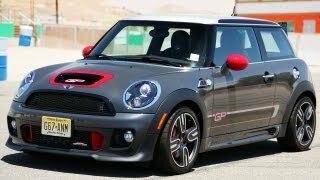 Mini has not confirmed the engine, but it is likely to be the 2.0-liter 4-cylinder turbo engine found in the Cooper S developing somewhere about 217 bhp (162 kW).